Sridevi is a true example of the fact that, talent doesn’t have a shelf life. She looks much fitter than she used to at the peek of her career. One of the finest actresses of our time, she looks the same she used to two decades ago, only better With a power that still mesmerizes anybody, nobody likes to believe the enchantress is over fifty years of age. After making her debut as a lead actress in the hind movie industry with in 1979, Sridevi never looked back and evolved both as an actress and a style icon with each passing year. Not only has she been appreciated for her acting prowess but also for her lively allure and style statements. Her first ever-stylish appearance was in Julie where she portrayed role of an Anglo-Indian girl dressed up in polka dot shirts teamed with knee-length skirts. Sridevi is one diva who pulled her sensuous-seductive roles with decent clothing, she never opted for bikini or skimpy clothing, and never did she choose skin-show as platform to garner attention. A rare combination of talent, beauty, style, Sridevi won too many accolades not just for her on-screen performances but also for her ceaseless charisma. Soon after Himmatwala came out in the theatres, Sridevi became a starlet overnight. Yash Chopra’s Chandni proved to be a turning point in Sridevi’s career as Sridevi got a makeover of sorts in this film. For the first time, Sridevi’s fans got to see a sensual side of the actress in Chandni. The film was a blockbuster and cemented Sridevi’s position at the top. In Lamhe Sridevi’s look was very regal. The actress played a mother and her daughter’s role and the look spanning over two decades that were distinct from each other. While, on one hand we had Sridevi in traditional Rajasthani attire; the other had her in off shoulder blouses and skirts. Even after break of 15 years when Sridevi made her come back in movie, her style wasn’t affected a bit. 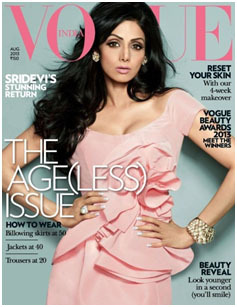 With English Vinglish, Sridevi gave an all new definition to women’s perspective towards themselves. Over the years, the actress has evolved her sense of style. Her sense of fashion is now more chic and westernized. While her contemporaries have found their style niche, she dares to juggle between traditional and trendy avatars elegantly and she manages to flit effortlessly between bold western silhouettes and brightly colored Indian ensembles.